WARNING! The meeting point is closed for moving. The reception point of El Valle BTT Centre is on the outskirts of Cofrentes, about 100 km from the city of Valencia, using the facilities of the former municipal football field. It is a privileged space for history and nature, through this center you know it deeply and enjoy the diversity of its landscapes safely. The human footprint is present throughout the valley in the form of castles, villages and hermitages scattered. The approach allows different routes to places of interest and make this an unforgettable experience. The network route consists of nine courses, with a total of 254 km. 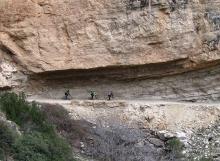 These routes are shared equally between four levels of difficulty and include names such as the Canyons of Júcar or Valley Castles. Its length is between 10 and 42 km. El Valle BTT Centre is located on the road to Spa Hervideros, on the outskirts of the town of Cofrentes, which is accessed from the N-330 that runs through the valley and unites Almansa with Requena.